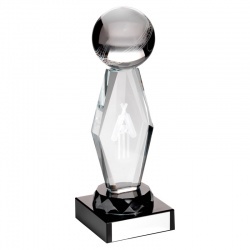 This selection of resin, crystal and glass cricket trophies and cricket awards offers outstanding value for money. 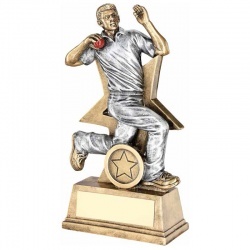 Perfect as individual cricket player awards or as team trophies for cricket competitions, all these cricket award items are offered with low, fixed-cost text engraving, free logo engraving and low, fixed-cost UK delivery. 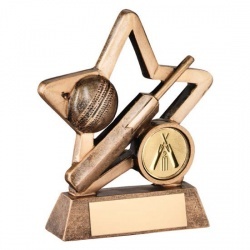 Resin trophy in bronze & gold colour with 3D cricket ball on star column. 3 sizes. 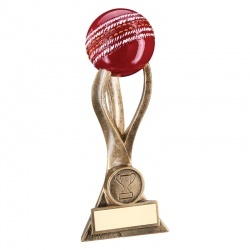 Resin trophy in bronze & gold with red cricket ball, with base plate. 3 sizes. 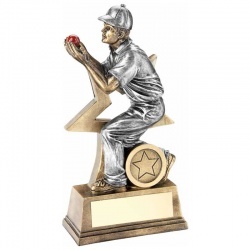 Resin cricket scene trophy in bronze, gold, silver & red. 3 sizes. 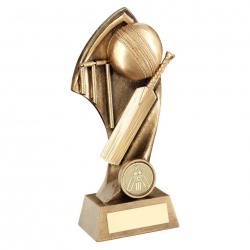 Resin bronze & gold colour cricket scene trophy with base plaque. 3 sizes. 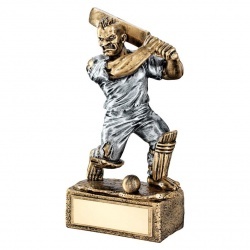 Novelty resin cricket trophy with 'beast' figure batsman. 6.75in tall. Modern black glass plaque in peaked design with cricket insert. 3 sizes. 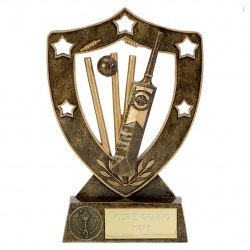 Detailed resin cricket scene in bronze and red finish, with base plaque. 3 sizes. 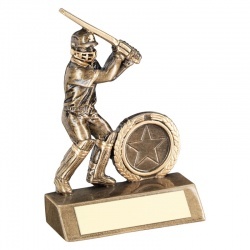 Resin batsman figure in silver and gold colour finish on base with plaque. 3 sizes. 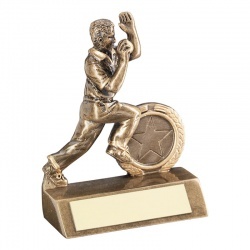 Detailed resin bowler figure in silver & bronze colour finish, with base plaque. 3 sizes. 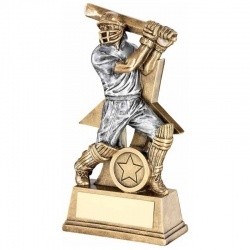 Resin cricket scene trophy in bronze & gold, with base plate. 3 sizes. 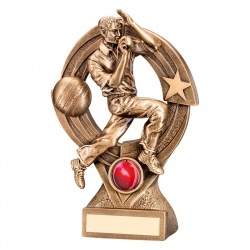 8.25in Resin Cricket Bowler Trophy with Engraving Plaque. 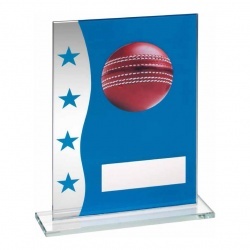 Jade glass plaque with 3D cricket ball and engraving plate on the front. 3 sizes. Resin Fully 3-D Cricket Ball on Twisted Stem and Base. 8.5in tall. Rectangular flat glass plaque in blue and silver with engraving plate. 3 sizes. 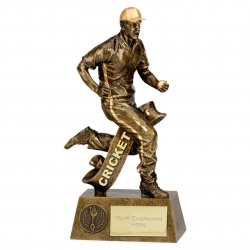 Resin Bronze Cricket Scene Award with Base Plaque. 3 sizes. 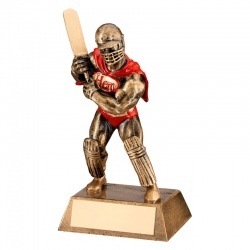 6.5in Bronze Finish Resin Cricket Batsman Hero Figure. 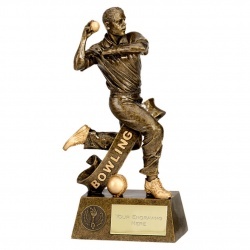 Resin Antique Bronze Cricket Bowling Figure on Base with plaque. 3 sizes. 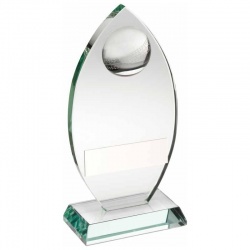 Glass Column with Full 3D Cricket Ball Detail, on Base with Plaque. 3 sizes. Grey / silver glass plaque with cricket motif. 3 sizes. 3.25in tall bronze and gold resin star award on base with engraving plate. 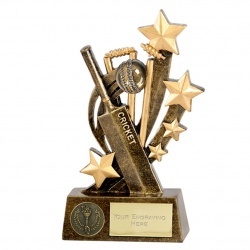 Bronze & Gold Colour Resin Cricket Scene with Engraving Plaque. 3 sizes. 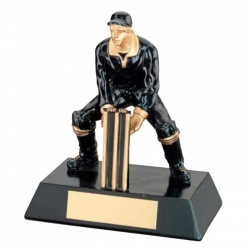 Resin Cricket Wicket Keeper Figure on Base with Plaque. 6.25in tall. 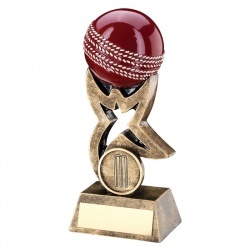 Resin Full 3D Cricket Ball Award with Base Plaque. 3 sizes. Resin Cricket Batsman Figure on Base with 1in centre. 3 sizes. 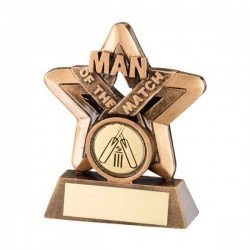 Resin cricket Man of the Match trophy with star backdrop. 3.75in tall. 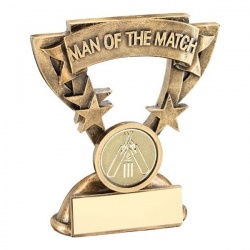 Resin cricket Man of the Match trophy with shield backdrop. 3.75in tall. 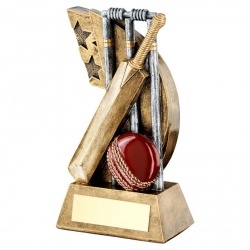 Resin cricket trophy with stumps & bails, to hold your cherished match ball. 6.5in tall. 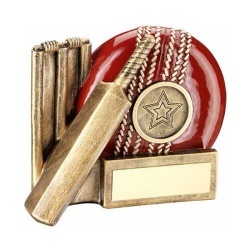 Resin cricket trophy with bat and star on base with plaque. 3 sizes. 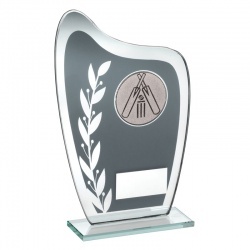 Resin Cricket Shield Awards with Engraving Plaque. 2 sizes. 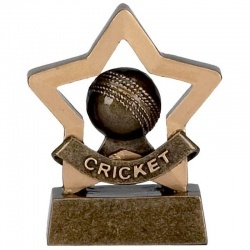 Resin Cricket Star Awards with Engraving Plaque. 2 sizes. 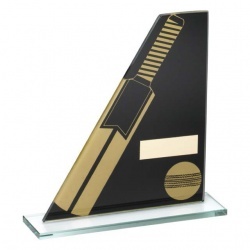 Flat glass plaque in black with gold highlights, with bat & ball motif. 3 sizes. 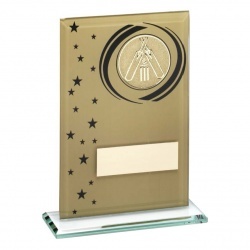 Rectangular glass plaque in gold finish with cricket theme insert. 3 sizes. 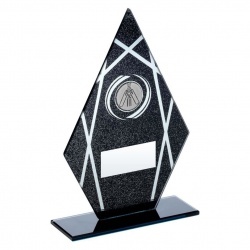 Resin figure in silver and bronze colour finish on base with plaque. Detailed resin figure of cricket fielder in action, on base with plaque. 2 sizes. 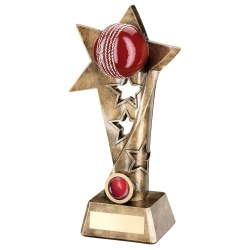 Resin cricket trophy with shooting stars motif, in bronze & gold colour finish. 3 sizes. 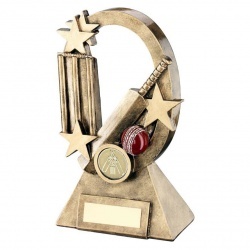 Resin cricket trophy in bronze & gold colour finish, with star studded shield. 3 sizes. 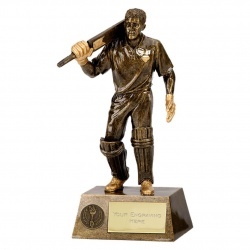 Detailed resin figure of (male) batsman, in bronze & gold colour finish. 3 sizes. Detailed resin figure of bowler in action on base with engraving plate. 3 sizes. 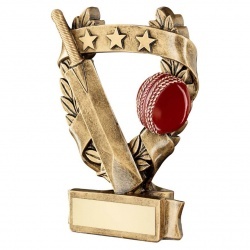 A choice selection of engraved cricket trophy awards including cheap cricket trophies and awards for particular roles, such as cricket batsman awards, wicket keeper trophies, cricket bowler awards and cricket fielder trophies. 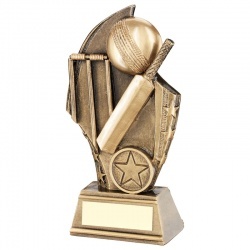 A cricket batsman trophy or cricket bowler trophy makes a coveted award for your top performers. 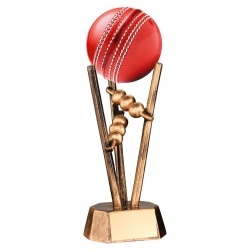 Crafted in durable resin, these highly detailed trophies also include generic cricket awards suitable for a wide range of achievements and presentations, from player awards to team trophies and tournament or competition prizes. 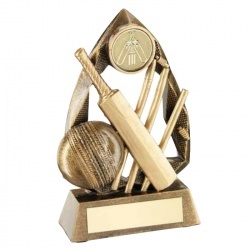 We also have cricket batting trophy awards and cricket fielder award trophies. 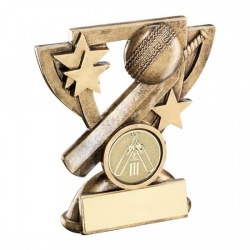 All these cricket trophy items can be engraved with event or winner details, and all are offered here with text and logo engraving options. UK delivery is fast with most orders are processed and delivered within five working days. 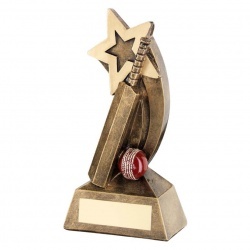 Order your cricket award today, with custom personalisation, and receive it within 5 days. Howzat for service!